Wake In Cloud B0184-BZ3-250-K(M) - Design】botanical flowers and green leaves floral pattern printed on white. Set includes1 x comforter2 x pillow casesSize InformationTwin - comforter 68" x 90", pillow cases 20" x 26". Full - comforter 80" x 90", pillow cases 20" x 26". Queen - comforter 90" x 90", pillow cases 20" x 26". King - comforter 104" x 90", pillow cases 20" x 36". California king - comforter 104" x 98", pillow cases 20" x 36". Easy caremachine wash in cold water, tumble dry on low or dry naturally, gentle cycle, do not bleach. Guarantee100% satisfaction with 30 night trial, return for full refund if you don't entirely love. Durable, breathable, hypoallergenic, fade-resistant and machine washable. Wake In Cloud - Botanical Comforter Set, 100% Cotton Fabric with Soft Microfiber Fill Bedding, Yellow Flowers and Green Leaves Floral Garden Pattern Printed on White 3pcs, King Size - Easy care】machine wash in cold water, gentle cycle, tumble dry on low or dry naturally, do not bleach. Guarantee】100% satisfaction with 30 night trial, return for refund if you don't entirely love. Simple modern gift for teens, boys, girls, men or women. Set】1 comforter 104x90 inches king size, 2 pillow cases 20x36 inches. Material】100% cotton outer fabric with ultra soft microfiber inner fill. Wake In Cloud A0184-BT3-K(J) - For extra pillow cases, please search B07GSRHNP1. Cotton】100% cotton, natural, hypoallergenic, durable, breathable, soft, fade-resistant and machine washable. Zip & ties】zipper closure, convenient to get your duvet in and out; corner ties to keep your duvet insert in place. Easy care】machine wash in cold water, tumble dry at low heat, gentle cycle, do not bleach. Design】botanical flowers and green leaves floral pattern printed on white. Please note: comforter or duvet insert is not included. Set includes1x duvet cover without comforter2x Pillow casesDesignCorner ties, to keep your duvet insert in place;Zipper closure, convenient to get the duvet in and out. Easy caremachine wash in cold water, tumble dry low, gentle cycle, do not bleach. 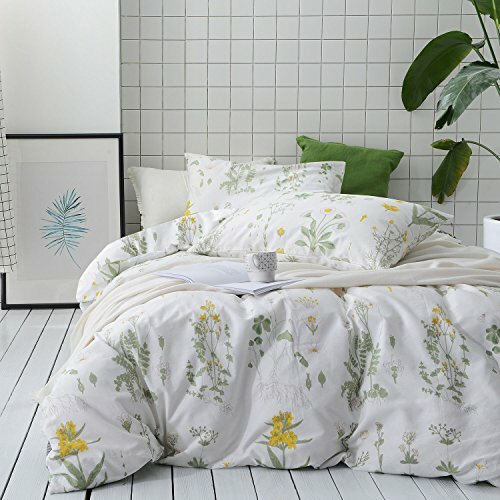 Wake In Cloud - Botanical Duvet Cover Set, 100% Cotton Bedding, Yellow Flowers and Green Leaves Floral Garden Pattern Printed on White 3pcs, King Size - Size informationtwin - duvet cover 68" x 90", pillow cases 20" x 26". Full - duvet cover 80" x 90", pillow cases 20" x 26". Queen - duvet cover 90" x 90", pillow cases 20" x 26". King - duvet cover 104" x 90", pillow cases 20" x 36". California king - duvet cover 104" x 98", pillow cases 20" x 36". Guarantee100% satisfaction with 30 night trial, return for full refund if you don't entirely love. HC Collection SYNCHKG056100 - Microfiber products are also the best choices for allergy sufferers and can help you rest better. 1800 platinum collectionlight to touch, cool and exceptional strength you can count on, our sheet sets assure you a great night's sleep. Designed with simple sophistication and ability to retain its vibrancy these brushed microfiber collections are the ultimate for light weight, crisp sleeping comfort. For extra pillow cases, please search B07GSRHNP1. Cotton】100% cotton, hypoallergenic, breathable, natural, soft, durable, fade-resistant and machine washable. Zip & ties】zipper closure, convenient to get your duvet in and out; corner ties to keep your duvet insert in place. Easy care】machine wash in cold water, gentle cycle, tumble dry at low heat, do not bleach. Perfect fit everytime guaranteed: deep pockets fits mattresses to 16'"; with fully elasticized fitted sheet! King Size 4pc Set -flat sheet 102" x 105", Hypo-Allergenic, 2 king size pillowcases 20" x 40"', Repels Dust Mites, fitted sheet 78" x 80", Environmentally Friendly!. Luxury you can see and feel: create a welcoming environment and a restful feeling in the bedroom with this top quality and AFFORDABLE Bedding Collection. Hotel Luxury Bed Sheets Set- 1800 Series Platinum Collection-Deep Pocket,Wrinkle & Fade Resistant King,White - Hc collectionultimate blend of craftsmanship and elegance, our linens are designed to offer you a unique and sophisticated sleeping experience. In addition it considered environmentally friendly as opposed to cotton. Cotton takes a lot of water to grow and many pesticides are used to grow cotton that causes serious pollution. Zinus OLB-PWPBBHE-12K - The zinus deluxe wood platform bed with paneled headboard works well with any style of home décor. The 5. 75 inch frame and legs are made of pine to support your memory foam, latex, or spring mattress. Expertly tailored design adds elegance and sophistication to any bedroom. You'll find yourself getting a restful night of sleep on our comfortable bed sheets. The zinus wood platform bed is 12 inches high and designed for use with or without a box spring foundation. Makes the perfect gift for any occasion! Style and comfort don't have to be mutually exclusive-the two converge beautifully with our large selection of bedding. Simple modern gift for teens, girls, boys, men or women. Zinus 12 Inch Deluxe Solid Wood Platform Bed with Headboard/No Box Spring Needed/Wood Slat Support/Antique Espresso Finish, King - Set】1 duvet cover 104x90 inches king size, 2 pillow cases 20x36 inches. 37 inch high Wood Paneled Headboard. Design】botanical flowers and green leaves floral pattern printed on white. Color selections are made to match other HC Collection products: Duvet Covers, Pillowcases & Bed Skirts. Strong wood slat mattress support for increased mattress life. Zinus - DROPSHIP OLB-ABS-9K - Easy assembly with all the needed tools included. Worry free 5 year warranty. Strong and Sturdy steel structure. For extra pillow cases, please search B07GSRHNP1. Cotton】100% cotton, hypoallergenic, soft, natural, breathable, durable, fade-resistant and machine washable. Zip & ties】zipper closure, convenient to get your duvet in and out; corner ties to keep your duvet insert in place. Easy care】machine wash in cold water, gentle cycle, tumble dry at low heat, do not bleach. Perfect fit everytime guaranteed: deep pockets fits mattresses to 16'"; with fully elasticized fitted sheet! King Size 4pc Set -flat sheet 102" x 105", 2 king size pillowcases 20" x 40"', Repels Dust Mites, fitted sheet 78" x 80", Hypo-Allergenic, Environmentally Friendly!. Zinus Armita 9 Inch High Profile Smart Box Spring / Mattress Foundation / Strong Steel Structure / Easy Assembly Required, King - Luxury you can see and feel: create a welcoming environment and a restful feeling in the bedroom with this top quality and AFFORDABLE Bedding Collection. Easy to assemble and no box spring needed. Top quality construction: our 1800 platinum collection sheet set is made from double Brushed Microfibers and are softer and more breathable then Egyptian Cotton. Design】botanical flowers and green leaves floral pattern printed on white. Espresso wood frame. All tools included for easy assembly. Vibrant colors made exclusively not to fade with washings! Microfiber fabrics are distinctive for their unique strength and thinness twice as fine as silk. MEILA AA-6 - Top quality construction: our 1800 platinum collection sheet set is made from double Brushed Microfibers and are softer and more breathable then Egyptian Cotton. For extra pillow cases, please search B07GSRHNP1. Cotton】100% cotton, natural, soft, durable, breathable, hypoallergenic, fade-resistant and machine washable. Zip & ties】zipper closure, convenient to get your duvet in and out; corner ties to keep your duvet insert in place. Easy care】machine wash in cold water, gentle cycle, tumble dry at low heat, do not bleach. Perfect fit everytime guaranteed: deep pockets fits mattresses to 16'"; with fully elasticized fitted sheet! King Size 4pc Set -flat sheet 102" x 105", fitted sheet 78" x 80", 2 king size pillowcases 20" x 40"', Repels Dust Mites, Hypo-Allergenic, Environmentally Friendly!. Luxury you can see and feel: create a welcoming environment and a restful feeling in the bedroom with this top quality and AFFORDABLE Bedding Collection. Vibrant colors made exclusively not to fade with washings! Microfiber fabrics are distinctive for their unique strength and thinness twice as fine as silk. MEILA Three Fabric Sides Wrap Around Elastic Solid Bed Skirt, Easy On/Easy Off Dust Ruffled Bed Skirts 16 Inch Tailored Drop White Queen/King - No risk purchase 100% satisfaction guarantee: just try our products and if you don't absolutely love them let us know and we will refund your purchase price NO QUESTIONS ASKED! We are so confident you will love our products like our other 5-star reviewers! You will be amazed at the customer service you receive after the sale! You have nothing to lose so ORDER NOW and consider buying an extra set for your loved ones. Mellanni SYNCHKG056085 - More durable than cotton. Highest quality brushed microfiber - made of the highest quality microfiber and workmanship so you know it LASTS! Fabulous selection of colors will make your bedroom look like it belongs in a magazine. Fits mattresses up to 16". Easy care - fade, stain, shrink and wrinkle resistant. Silky soft, guest room, moms and Dads, kids room, most comfortable and luxurious bed sheets you can find. Adjustable elastic trimmed ruffle makes it so easy to put on and take off your bed, that you won't even need to lift the mattress. Order now! design】botanical flowers and green leaves floral pattern printed on white. 4 Piece Queen, White - Brushed Microfiber 1800 Bedding - Wrinkle, Fade, Stain Resistant - Hypoallergenic - Mellanni Bed Sheet Set - Makes the perfect gift for any occasion! Best for any room in your house - bedroom, vacation home. Machine wash in cold. Dries quick on tumble dry low. Pre-shrunk to protect against any shrinkage after washing; machine wash cold gentle cycle; do not bleach; tumble dry low heat. Color selections are made to match other HC Collection products: Duvet Covers, Pillowcases & Bed Skirts. Convenient and compact packaging. 37 inch high Wood Paneled Headboard. Vibrant colors made exclusively not to fade with washings! Microfiber fabrics are distinctive for their unique strength and thinness twice as fine as silk. Wake In Cloud B0211-BZ3-250-K(M) - Great gift idea for men and women, RV, Valentine's - Mother's - Father's Day and Christmas. Queen size luxury 4pc bed sheets set - 1 flat sheet 102"x90", 2 pillowcases 20"x30". Convenient and compact packaging. Available in twin, king, Queen, Twin XL, Full, Cal King. Worry free 5 year limited warranty / Box Spring only, Bed frame sold separately. Color selections are made to match other HC Collection products: Duvet Covers, Pillowcases & Bed Skirts. Feel the difference - sleep better and wake up each morning feeling refreshed and full of energy. Durable, hypoallergenic, breathable, fade-resistant and machine washable. Easy care】machine wash in cold water, tumble dry on low or dry naturally, gentle cycle, do not bleach. Floral Comforter Set, Botanical Flowers Pattern Printed, 100% Cotton Fabric with Soft Microfiber Inner Fill Bedding 3pcs, King Size - Wake In Cloud - Guarantee】100% satisfaction with 30 night trial, return for refund if you don't entirely love. Expertly tailored design adds elegance and sophistication to any bedroom. Strong and Sturdy steel structure. Fits mattresses up to 16". Easy care - fade, stain, shrink and wrinkle resistant. Pre-shrunk to protect against any shrinkage after washing; machine wash cold gentle cycle; do not bleach; tumble dry low heat. Available for queen/King BedMattress With 16 Inches Drop. HC Collection SYNCHKG053722 - With such benefits, it is no wonder microfiber is most people's favorite when it comes to bedding. Easy to care for:Machine wash in cold with like colors. Easy to assemble and no box spring needed. Allergens like dust mites and pollen cannot get in the densely weaved strands. In addition it considered environmentally friendly as opposed to cotton. Convenient and compact packaging. Hc collectionultimate blend of craftsmanship and elegance, our linens are designed to offer you a unique and sophisticated sleeping experience. Adjustable elastic trimmed ruffle makes it so easy to put on and take off your bed, that you won't even need to lift the mattress. Cotton takes a lot of water to grow and many pesticides are used to grow cotton that causes serious pollution. Fits mattresses up to 16". Easy care - fade, stain, shrink and wrinkle resistant. These fibers are even thinner than most luxurious natural fibers such as silk. Vibrant colors made exclusively not to fade with washings! Microfiber fabrics are distinctive for their unique strength and thinness twice as fine as silk. Hotel Luxury Bed Sheets Set-- 1800 Series Platinum Collection-Deep Pocket, Wrinkle & Fade ResistantKing,Sage - Don't settle for cheap imitation: there may be cheaper alternatives offered online but our top selling quality bedding products are made with the highest qualitY FABRIC so you know it lasts! Made from 100% Double Brushed Microfiber fabric for OPTIMAL SOFTNESS YOU CAN SEE AND FEEL! Wrinkle and Fade Resistant; Hypoallergenic & Resistant to dust mites; EASY TO CARE FOR: Machine Washable, Tumble dry low. HC Collection SYNCHKG039821 - Expertly tailored design adds elegance and sophistication to any bedroom. Allergens like dust mites and pollen cannot get in the densely weaved strands. Style and comfort don't have to be mutually exclusive-the two converge beautifully with our large selection of bedding. Best for any room in your house - bedroom, vacation home. Feel the difference - sleep better and wake up each morning feeling refreshed and full of energy. Pre-shrunk to protect against any shrinkage after washing; machine wash cold gentle cycle; do not bleach; tumble dry low heat. Cotton takes a lot of water to grow and many pesticides are used to grow cotton that causes serious pollution. Hotel Luxury Bed Sheets Set- 1800 Series Platinum Collection-Deep Pocket,Wrinkle & Fade Resistant Queen,Sage - . Convenient and compact packaging. Makes the perfect gift for any occasion! Vibrant colors made exclusively not to fade with washings! Microfiber fabrics are distinctive for their unique strength and thinness twice as fine as silk. Don't settle for cheap imitation: there may be cheaper alternatives offered online but our top selling quality bedding porducts are made with the highest qualitY FABRIC so you know it lasts! Made from 100% Double Brushed Microfiber fabric for OPTIMAL SOFTNESS YOU CAN SEE AND FEEL! Wrinkle and Fade Resistant; Hypoallergenic & Resistant to dust mites; EASY TO CARE FOR: Machine Washable, Tumble dry low.